When I was a kid, my family and I used to go to the California apple country area of Oak Glen almost every fall. By the way, I said “area” because I just looked up Oak Glen and it seems that it’s not technically a city. Any way, it was such a treat. We’d all get in the van and prepare for an hour long trip up to the mountains. We’d come home with a gallon or two of delicious apple cider and a bag full of apples. Inevitably, my mom would take those apples and turn them into apple pie or apple crisp. I recently made her apple crisp myself, partly because I was craving it and realized that apples are in season already, but also partly so I could take photos of it for the family cookbook I’m working on. My mom was gracious enough to let me share the recipe here with all of you. 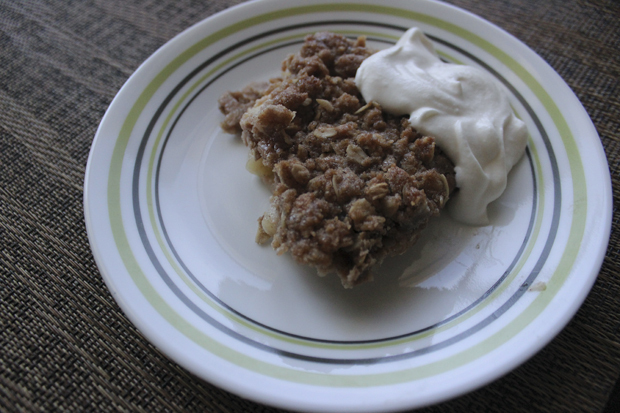 I paired it with some home-made whipped cream, which you can see in the photos. Of course, it also goes great with vanilla ice cream. Heat oven to 375°. Place apples in 8 or 9 inch square pan. Sprinkle with lemon juice and water. In small bowl, combine remaining ingredients by using two forks or a pastry blender until crumbly; sprinkle over apples. Bake for 40 to 45 minutes or until apples are tender. As you may be able to tell by reading the recipe, this is incredibly easy. The hardest part is peeling the apples without cutting yourself, and hopefully that’s not too hard for you. I only got a small nick. It’s much easier to make any kind of crisp than pie, generally, because you don’t have to worry about working with dough. Give this recipe a try soon and let me know what you think!